Seven leadership practices that work. We explain the research behind why each practice works and offer suggestions on how you can use it to improve personal and professional success. 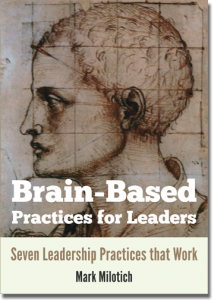 Enter your information below to receive your free copy of Brain-Based Practices for Leaders. …chock full of the latest brain science to explain not just what you should do to be a great leader / manager but – importantly – WHY. Well thought out and researched, brilliantly structured and with great and positive advice. Great read, direct and to the point. No fluff. Great for reference.